Mary Collingwood was born 2.7 1927 in Camberley, Surrey. Her father a railway worker had been in Allendale, working on Caton station . 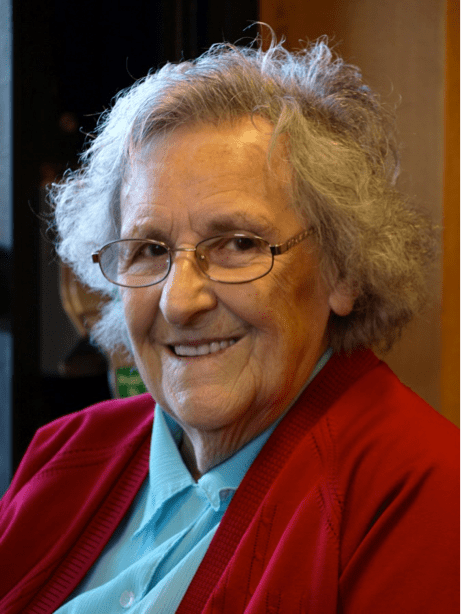 She loved living in Allendale and attended the local school but it involved a two mile walk and they were often late- playing on their way – this got them into trouble. Her father was moved to the Tyne and they were offered a railway house in Pelaw and she went to school at Heworth (on site of Metro Station). Mary’s Dad had two allotments and they never went short of vegetables. She left school at 14 and went into service for two years near to her Grandmother in Surrey. She missed home and so came back to Pelaw when the war was nearly at an end, working first at Leather Goods who were making ammunition boxes- her mother had heard they were setting people on so a trip to the Labour Exchange got her the job. She then went to the Cabinet works where she was putting handles on doors and other small jobs but when the men returned from the war nearly all the women were made redundant and set back to the labour exchange. The women Mary knew just accepted that the men should get their jobs back. Mary then went to the Dry Saltery which she called the Drugs. She was filling packets with Semolina, Custard Powder, if there was no work in their room they were sent to work packing flour, Bicarb soda wrapped in packets, in the wet end with essences such as vanilla. The Supervisors were Kitty Brown who lived opposite and Sadie Arm from Windy Nook. People came from a wide area, the tram cars stopped at Heworth ( where the Metro Station is today) she remembered hundreds coming along the road to work in Shirts, Leather Goods, Canteen, Drugs and Dry Saltery, Tailoring, Printing and Cabinet Works. When she started at the Dry Saltery, married women had to leave but in the post war years of full employment they had to take married women. When Mary worked at the Quilting- she filled cushions and tea cosies with kapok- once filled they went to the machinist to be finished off. They worked 8-5, had a 10 minute tea break at 10 am and then 1 hour for dinner ( went home and used the time to prepare their own dinner for when they finished work. In the 1950’s the quilts were filled with down, this changed to Terylene. The factory closed when she was about 40 when the work went to Manchester. Down quilts were going out of fashion. On the middle floor they were making dressing gowns, quilts and sanitary towels on the top floor. You were shown what to do and otherwise no training, the only apprenticeships were those given to men who worked on the maintenance of machinery. She didn’t remember TU , nor any industrial disputes- you didn’t mess about – you accepted you were there to work. The Quilting was stricter than the other factories but not as strict as other factories in the area- she had worked for Tyne Textiles. Mary didn’t remember any social activities organised by the factory- the girls would seek permission but organise a beano for themselves – bring in cake, biscuits and sandwiches. In those days you were expected to work, got a job and that was it- didn’t quibble about it. She went back to work part time at the quilting, full time when the boys were at school and her mother looked after her little girl.